Thanks for the great ideas. I’m in the process of writing a grant to purchase picture books for my 6th grade language arts classroom. Can you or your students recommend your top 10-20 titles? Should I buy multiple copies? Thanks in advance. I don’t think you need multiple copies, we just have one copy of each. I will write a post highlighting our favorites! I have a very unorganized book loving classroom. It stresses me out. The unorganized part. Note the book loving part. I’m quite proud of the book loving part. Thank you for validating some of my unorganized practices. I always kick myself for not doing a better job of keeping track of my books. My hope is that wherever those lost books are, they have found a loving home. Thank you so much for this!!! I needed this checklist as I have been debating how to organize my books this year. It is always a daunting task! Love the idea of the pre-printed label comments! Any chance you’d be willing to share your list of common comments? If I remember correctly, they were asking them to focus on authors craft, adding more details, or further explaining their thoughts. I will look at school. These are great! I have students sign them out of a book, but I am not vigilant about it. I usually have a stack of books return to me at the end of the school year. Any chance you could share some more pictures? I love seeing other people’s classrooms! Last year will be the last time I use a book sign out method. They drive me crazy, lol, and waste my time. I will not use one this coming year. I’m going to use the honor system. Every year I lose a few books and I’ve just decided that is the price of having a book loving classroom. 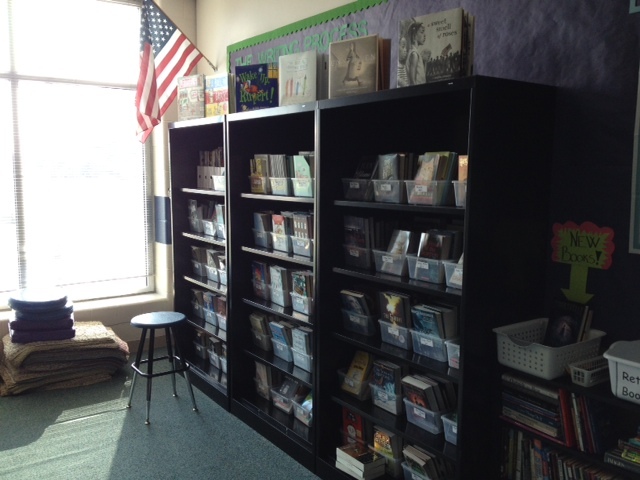 I teach third grade and have thousands of books. I do like your idea of a book return basket, however I think I might just call it the “where does this book go?” basket. The volume of books that rotate through my class is huge and I wouldn’t be able to keep up. Instead of just throwing their book in any old basket they can put it in the return basket. Like most classes I have those student experts that love sorting the books and I will count on them to help file lost books. I love that your Reader’s Notebooks stay in the classroom, but I have a question for you. My students take both their book and notebook back and forth from school to home so they can always have their notebook for a stop and jot. However, that makes it nearly impossible to collect them and read them! So, do your students only respond to their reading in class? I do not have them do responses at home because I want to really just give them time to enjoy their stories. So they only do responses here in the classroom. Thanks for these ideas. I was given a spinning rack that I hadn’t decided what to do with. Now I am going to turn into a Student Favorites Rack!